2.01ct Heart Shaped Fancy Intense Yellow Diamond. Surrounded by three flower petals with deep orangy yellow diamonds and white marquise diamonds, 2.07ctw. Made in 18K WG. 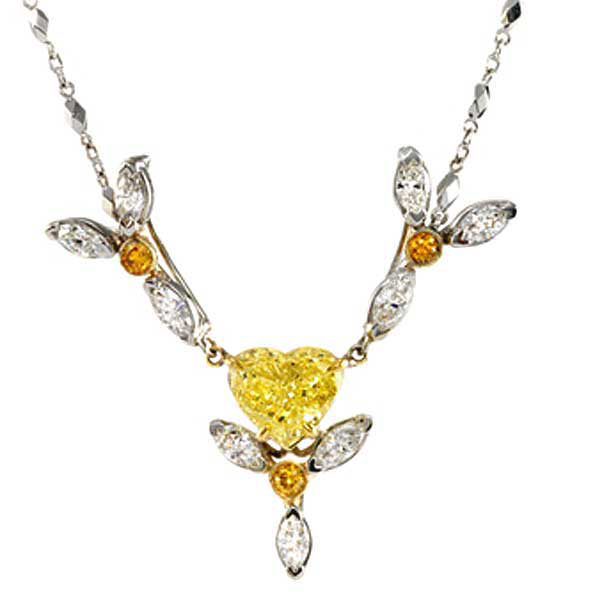 2.01ct Heart Shaped Fancy Intense Yellow Diamond Set In A 18K Gold Neacklace Surrounded By Three Flower Petals with 0.24ctw=(3) Deep Orangy Yellow Diamonds And 1.82ctw.=(9) White Marquise Diamonds.